Exploration is one of the three main professions a character can learn. We have already covered the first profession in the last Rangers Of Oblivion post, you can check it here. In today’s post, we are going to share every basic aspect of exploration profession and why you need to master it for better items and treasure. Always remember that the Wilderness has loads of things to discover; you can craft a variety of materials by gathering ingredients/material at many locations(for example; Alchemy, Leia). Exploration lets you gather crafting material, breeding material, treasure maps, and much more. So let’s dive in! Exploration Profession unlocks at level 13. You can learn it by completing the quest; Exploration for beginners. Once you reach level 13, complete that quest and you will get a fishing rod, fishing bait, glass bottles(contains treasure map), and silver coins. To trigger it, tap the menu -> achievements -> at the bottom, go to the path to greatness tab -> level 13/exploration -> go complete. At the same time, you will also learn about the fishing, treasure map. By fishing, you can obtain rare/common fish, items(ember, rainbow shell, cat toy, duckling toy, glass bottle, crystal bottle, chest). Each item has different use; ember – crafting, Rainbow shell – exchange at Leif’s shop, glass bottle – to get a treasure map, crystal bottle – get superior treasure map or intermediate treasure map, chest – random item. And you can use fish in cooking or sell for silver coins at Avril’s shop. To start the fishing, you will have to enter the wilderness. Open the map and find Cassandra. Interact with her and choose exploration to enter the exploration area. Prior to it, if you have a treasure map, then use it(bag -> items -> map -> use -> scan -> begin). In the exploration area, find the water zone and go close to it. 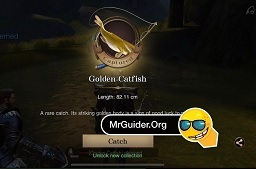 A hook button will appear, tap it -> select the fishing rod and bait(you can also purchase equipment, the bait of rare quality to increase the chances of getting a rare item from fishing). You can also purchase it from Leif. After it, press and hold the fishing rod button at the bottom-right side of the screen – change distance. Use the < > keys to catch the fish or item. Exploration mastery points are required to increase the exploration mastery level. When the exploration mastery level increases, you will be able to level up or unlock new exploration skills; buffs. 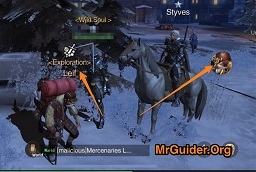 Tap the menu button -> skills -> professions -> Exploration -> mastery. You can get exploration mastery points by fishing, treasure hunts, and by working for Leif. Leif – Open the map and on the left side NPC list, search for Leif. Tap his name to go there. After it, interact with him for events, fishing contest, exploration items, and to exchange rainbow shell. You can earn precious items from the treasure chests. But to investigate the treasure in the wilderness, you must have a treasure map. You can get treasure maps from the glass bottles or crystal bottles. And, you can get these bottles by fishing or from exploration shop. Exploration Shop – Visit Leif -> interact with him -> exploration shop -> treasure -> drifting bottles. It will cost you gold. You can either sell fish for silver coins or use in the cooking. If you are low on silver coins, then selling fish is not a bad idea. Open the map -> on the left side NPC list, search for Avril -> tap her name to visit there -> interact with her -> cooking shop -> sell -> ingredients -> sell.